All works in this series are gouache on archival digital print on Hahnemühle paper. 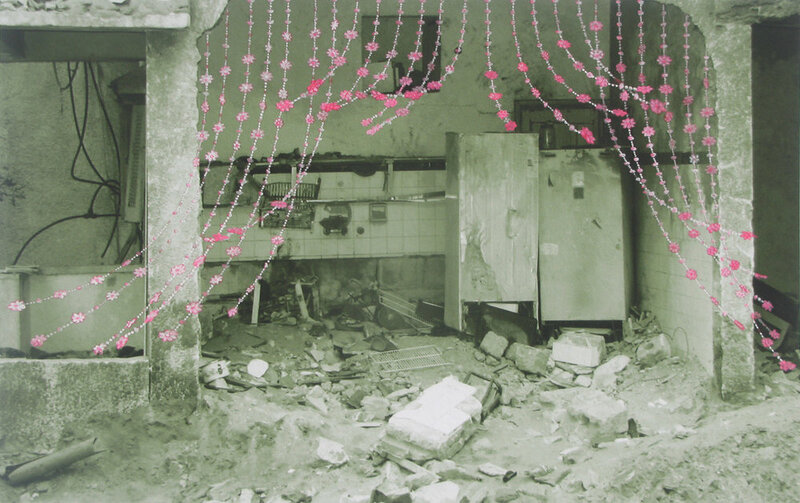 R&R(…&R) culls images of regeneration from the art and architecture of areas in current or recent conflict. Referring to scenes of daily life, construction and cultivation, I paint passages of resurgence (from the workshops of Persian miniaturist Bihzâd to the court arts of Safavid Iran) over photographic scenes of devastation across Afghanistan, Iraq and the Middle East. Sources for these contemporary scenes are “documentary” images found on the internet — from military and news media sites, FLICKR and Webshots, and blogs by soldiers and others in the midst of war. I am not deluded that these “restorations” offer any actual balm, but hope that they induce an empathic unsettlement, that they pose questions about our complicity in, as well as our seemingly miraculous recovery from, incomprehensible and often self-inflicted destruction. Gouache on archival digital print/Hahnemühle, 16 x 20 inches; 24 x 28 inches framed. 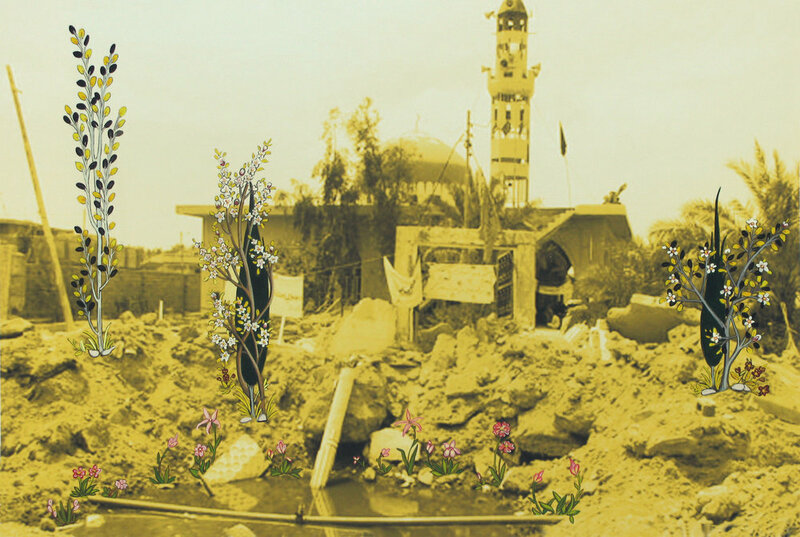 To show a culture building itself, a ghostly version of a scene from Bhizad’s 15th c. Building of the Great Mosque of Samarkand is painted over an altered internet image of rubble left by a 2006 Israeli air strike in Beirut. This structure has its own history of decay and rebirth that is entwined with conquest and commemoration. Fearing he would die before its completion, the Persian conqueror Tamerlane (who referred to himself as the Sword of Islam) ordered the Bibi Khanum Mosque in Samarkand to be built in haste. Consequently, it began falling apart prematurely and existed as ruins for almost six centuries. After 1974, it was rebuilt by the Soviets albeit greatly reduced in size. Perhaps this structure is an object lesson on the impetuous, on thinking before we act, especially when it comes to guerilla or state-sponsored warfare. 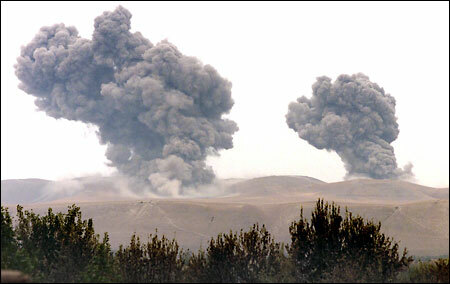 Plumes from bombs in Afghanistan rise from a seemingly empty landscape. They are framed by flora and fauna to recall a more idyllic, peacetime nature. Gouache on archival digital print/Hahnemühle paper, 16 x 20 inches; 24 x 28 framed. Appropriating passages from cultural traditions other than my own has its risks; it can mimic the very idea of conquest that I am critiquing. Nonetheless, as an admitted outsider, I am trying to bridge cultural divides that are both real and constructed. Incorporating imagery from the former Islamic Empire is one way of dispelling prevalent stereotypical notions of its contemporary regions and religions as solely proponents of malignant fundamentalism. My selections counter the media’s endless images of militancy and martyrdom, juxtaposing the highest aspirations of a culture with evidence of its eradication. 12 x 21.5 inches, 19.3.75 x 28.25 inches farmed. 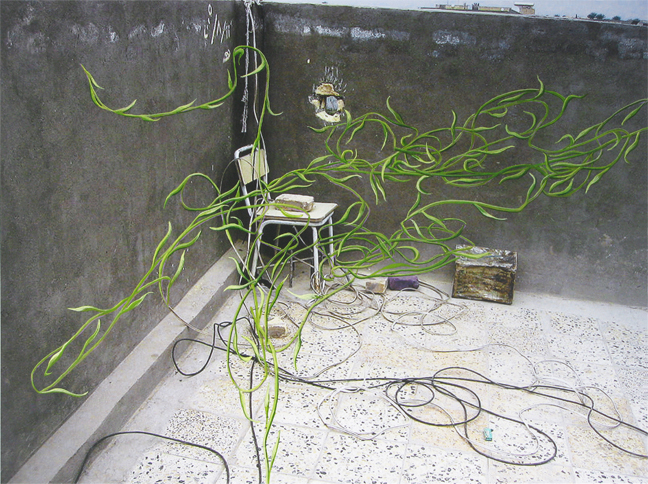 This scene of Saddam Hussein’s bomb-damaged palace in Baghdad is modified from an AP photo posted on FLICKR. The figures are derived from The gatekeeper denies entrance by one unworthy of the garden in the Bustân (The Orchard) by Mîrak or Bhizâd. Who is worthy of entering the garden and to whom does the garden belong? This work shows a road destroyed in 2006. The rebar grid substructure has been painted back in to figuratively begin rebuilding the road. The yellow circles are enlarged projections from the distant headlights. They sit right on the surface, in the viewer’s realm, possibly implicating us as co-sponsors of the destruction or as passive witnesses. Rubble renders place anonymous; it eradicates all distinguishing features. In Restoration, the transparent white tracery of a mashrabiya (the ornate wooden latticework prevalent in traditional Arab architecture dating to 12th century Baghdad) balances precariously among piles of dust, debris and concrete. The presence of this ornate detail insists that the targets of war are neither faceless enemies nor sites devoid of culture. They are not just anywhere but somewhere, not just anyone but someone. A painted detail of drapery suggests a bygone domestic tranquility against three stories of rooms left exposed bya gaping hole in the wall. The curtains are the same as those that frame two seated men in a 13th century illustration by al-Waiti for al-Hariri of Basra’s “Maqamat,” a set of 50 short stories named after 50 Muslim cities that is one literary pinnacle of the Arabic language. Al-Wasiti’s illustrations were highly regarded for portraying a specific world and capturing aspects of daily life. Inserting details of home decor resists the anonymity that war confers on place and person. A stork flies above and oblivious to the wreckage of an unexploded bomb that has crashed through the ceiling of a Lebanese home. Its flight contrasts the dead and dangerous weight below. The stork is revered in Islam for making annual pilgrimages to Mecca while English symbolism assigns it conflicting associations with the maternal or the tyrannical. A detail of a painted garden from a Persian miniature fills the silent TV screen, hearkening to a more idyllic or paradisiacal time. Gouache on archival digital print on Hahnemühle paper, 10 x 15 inches; water motif from illustration by Master Ahman Mûsâ in a Mi-râj-Nâmeh (“Book of the Mystical Ascension”), Tabrîz, second quarter of the 14th century, Topkapì Sarayì Museum Library, Istanbul. Stylized waves lap impossibly at edges of craters in Lebanese roads bombed in 2006, merging the transcendent with the mundane. Gouache on archival inkjet print on Hahnemühle paper, 8 x 6 inches. Photographic source of broken pottery in Larsa, southern Iraq by Joanne Farchakh. 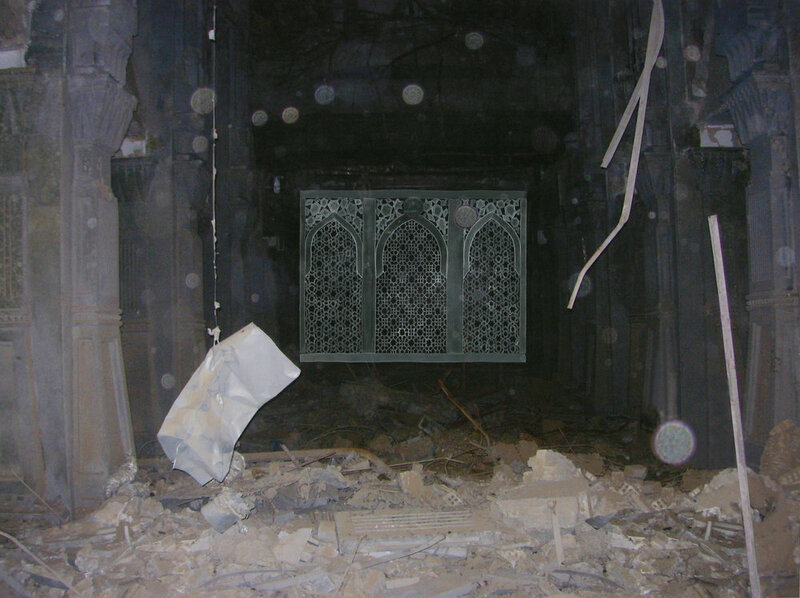 Many items were stolen or destroyed by looters at unsecured archeological sites during the Iraq War. Here, broken pottery lies like broken limbs in the dust at Larsa, a major Sumerian capital in today's Nasiriya, in southern Iraq. A hand-painted modern prosthetic arm occupies the foreground as an inadequate replacement for the scope of loss. The Al-Askar Mosque in Samarra, Iraq is one of Shiite Islam's holiest sites as it houses the tombs of two 9th c. imams, direct descendants of the Prophet Muhammad. Sunni extremists destroyed its dome in 2006, the first time that internal forces had targeted one of the country's central religious symbols. Its two remaining minarets were destroyed in a 2007 bombing by al-Qaida operatives. Both incidents caused widespread rage and panic amongst Shiite Muslims and ensuing sectarian violence. A dome descends upside down from the sky in Redoubt, acknowledging the upheaval. Its point is like a brush, with potential to visualize restoration and a time of greater tolerance. Even though the golden dome and minarets of the Al-Askari Mosque were restored in 2009, divisions of faith, fanned by the tensions of occupation and war, continue to threaten sites both secular and sacred. Wrestling Over Ruin represents violence arising from violence in an eternal struggle between two dragons battling in the heavens over the U.S. bombing of Baghdad. 18 x 24 inches. Grille pattern from tomb of Muhammed Ghaus in Gwalior (16thc); background photo source: Webshots: johndrummer16, album#5 Iraq 2005. John Drummer posted this image as an 11B "Infantryman" in the 82nd Airborne Division. His last available posted album was titled ‘Good Times”, September 25, 2009. The gap between Ghaus, a sainted Sufi author of “The Ocean of Life” and Saddam Hussein, a brutal dictator, reflects the distance between our highest aspirations and most tragic failures. Transparent white latticework balances precariously amidst the 2006 rubble of Khiyam, Lebanon. 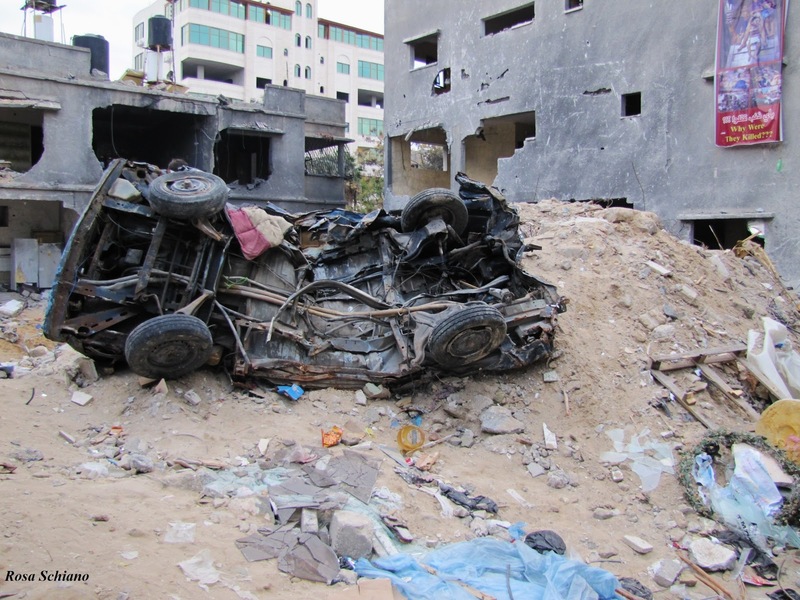 Bombing eradicates anything that distinguishes one culture, population or place from another. Rebar, concrete and dust all look the same when collapsed in mangled heaps. Inserting specific ornate architectural details counters the anonymity conferred by ash and rubble. Mashrabiyas, the carved perforated wooden screens of Islamic architecture dating to 12th century Baghdad, are among such details, reminding us that this is not just any place, but some place. Transparent white tracery of a mashrabiya (the ornate wooden latticework prevalent in traditional Arab architecture dating to 12th century Baghdad) hovers in or beyond an open doorway of a room with mortar-scarred walls. The architectural detail may hover as an apparition or suggest continued vulnerability. Inserting specific references (from painting, architecture and literature) into contemporary media images insists that the targets of war are neither faceless enemies nor sites devoid of culture. They are not just anywhere but somewhere, not just anyone but someone, not distant tribes, but complex societies with their own hopes and dreams. Screenprint with solvent transfer, 18 x 15 inches paper size, 14.5 x 11 inches image size. Edition of 20. Sources: FLICKR_pt_stebbing photo stream of Iraq; “The Fairy Queen enthroned in her theophany atop the Tree of Life which springs from the fount of life”, study for an illustration to Nizâmi’s Tale of the Princess of the Black Pavilion, Tabrîz or Qazwîn, mid 16th century. Freer Gallery, Washington D.C. 50.2. The Black Pavilion is the first of seven tales that comprise Nizami’s 12th century book of poems “The Seven Beauties.” It embodies eternal human experiences such as love, desire, frustration and melancholia. Printed by RED LETTER PRESS, Youngstown State University. Islamic patterning typical of mashrabiyas (ornate wooden latticework prevalent in traditional Arab architecture dating to 12th century Baghdad) fills bombarded windows of a contemporary building in the Middle East. Aspirational repair of the bridge north of Beirut destroyed by an Israeli air strike early on Friday August 4, 2006. 16.25 x 23.5 inches 25.75 x32.5 inches framed. Sources: Basra University Central Library destroyed by fire, June 2003. http://archive.ifla.org/VI/4/admin/iraq2407/pages/BASBU5.htm; The library of Basra, miniature by Al Wasiti from "Maqamat" by Al Hariri, 13th century, Hulton Archive. Gouache and graphite on archival digital print/Hahnemühle paper, 16.125 x 20.125 inches. 7 x 10 inches. Lion from 14th century manuscript, Iraq. Photo source: Joanne Farchakh-Bajjaly. In Rise: Active Intelligence, the image of archangel Jibreel or Surôsh (Active Intelligence) is superimpsoed over a contemporary war scene in Iraq. Glowing and hovering in an explosive fire that can be apocalyptic or annunciatory, the image of this angel is open to interpretation. One could infer an inherent critique of the erroneous “intelligence” that was used to justify a “pre-emptive” war. One could lament the absence, in this case, of “Active Intelligence” — one that provides divine, rather than idiotic, inspiration. One could heed Surôsh’s call to retreat from “Satan’s whispers” or all our evil will and deeds. 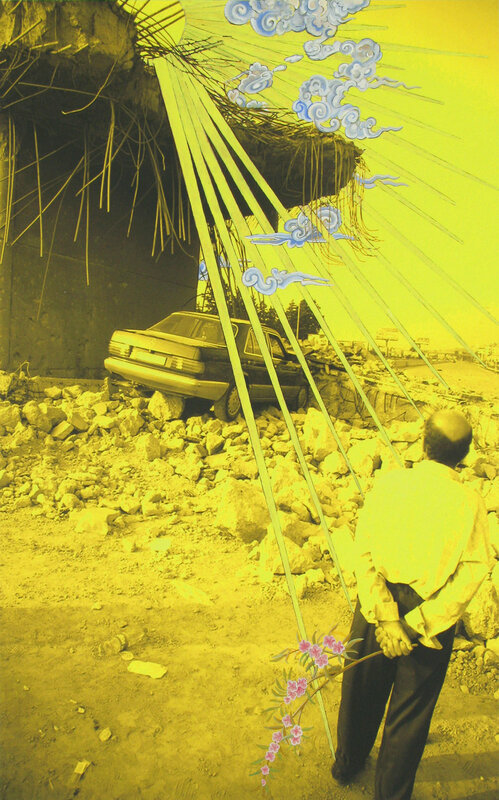 For this specific image, a photographic image of an oil fire from a Baghdad album by Coug91 on Webshots is altered and combined with a digitally collaged and hand-painted camel from a Persian miniature. The photographed and painted camels are both oblivious to the fire on the horizon, though one bears a flaming hump. It refers to Timur’s defeat of the Delhi Sultanate in 1398. Timur (or Tamerlane) was the 14th century Turco-Mongol conqueror of much of western and Central Asia. Faced with theDelhi Sultanate's 120 war elephants, Timur prayed to Allah, then attached straw to the backs of his army of camels. As the camels neared the elephants, Timur ignited the straw, propelling the distressed camels forward in wild terror. The frightened elephants ended up crushing many Indian troops as they fled in retreat. The confluence of the past and the present, the hand-made and the mechanical or digital, passivity and aggression all speak to contradictory forces at work in current quagmires, especially in Iraq and Afghanistan. Gouache on Hannemuhle paper, 6 x 10 inches. Bird clouds from The combat of Rustam and Kãmus in Shah Tahmãsp’s Shãhnãmeh, attributed to ‘Abd al-Vahãb, c.1530, fol.271a, Tehran Museum of Contemporary Art. Collection of Paul Eiss, Pittsburgh. 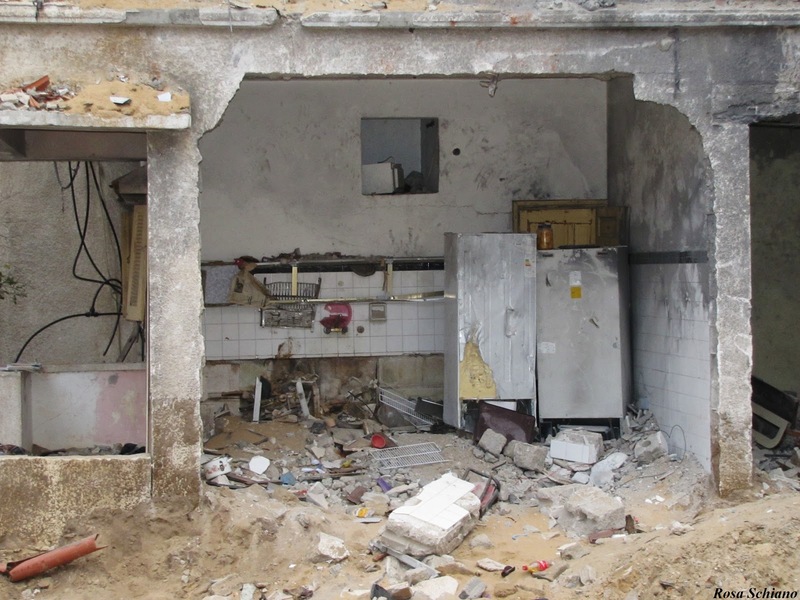 The Israeli “Pillar of Defense” military offensive in Gaza on November 12, 2012 that killed 72 people including Mzanar Abdallah, 20, and Amina Mznar, 80, an elderly woman sitting in the kitchen in her wheelchair at the time of the bombing. The plastic beaded curtain is painted as if propelled outward by its blast. If only it were a gentle breeze. Gouache on archival digital print/Hahnemühle paper, 12 x 16 inches. Figure from Prince Humây before the palace of Princess Humâyûn of China” by Junayd for the early 14th-century romance, Humây and Humâyûn by Khwâjû Kirmânî, British Library, London. Photo source by Joanne Farchakh-Bajjaly: Southwest Palace of Sennacherib: damaged relief slabs. Prince Humay, on his pilgrimage from the ‘dusky’ realm of matter in the West [in this case, Syria] calls upon, the Princess Humâyûn who represents the spiritual East or ‘China,’ the horizon of the Godhead’s rising sun”. Gouache on archival digital print/Hannemuhle paper, 7.625 x 10.25 inches. 15 x 17.125 inches framed. Gouache on digital print/Hahnemühle paper, 16 x 20 inches. Tree motif from mosaic at Khirbat al-Mafjar, Jericho. Gouache/Hahnemühle paper, 6 x 8.125 inches, 12 7/8 x 14 5/8 inches framed. A 13thor 14th c. Iranian tile design spans the gap of Baghdad’s al-Sarafiya Bridge that was destroyed by a truck bomb in 2007. Pairing the elegant decorative geometry of Islamic design against the contemporary geometry of engineering points to the choices we make, how we direct our expertise and ingenuity. These rabbits are derived from Persian miniature paintings, playing whimsical representations of the past against a sober scene of contemporary destruction. The situation becomes all the eerier through an abandoned tricycle with its plastic rabbit head, the only intact item left standing in the rubble. Violence toward the innocent becomes all the more palpable, in a still place with no human presence.